Many people all over the world are opting for healthier ways to live, which is a great step towards self improvement, given the persistent unavoidable stress we all have to go through every day of our life! Eating healthy and choosing alternative eating pattern based on the popular researches has opened up doors for us to enjoy the life with a different perspective. With the same view in mind, a majority of the population is switching to Paleo diet, which is a popular way to eat and promotes eating a low carb diet. 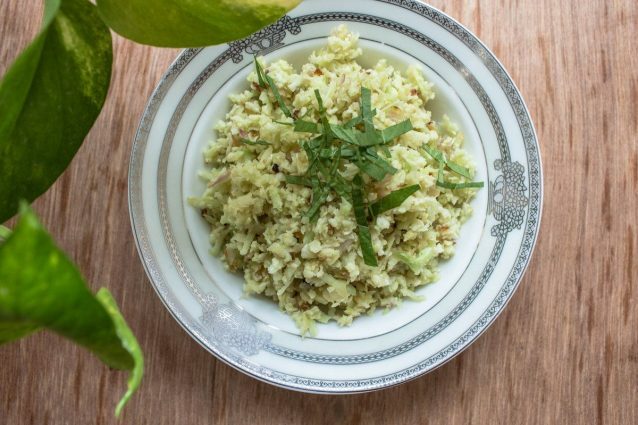 Here we bring to you a delicious preparation that certainly reiterates the concept of eating ‘healthy food yet tasty food’… This herbed version of the simple cauliflower rice preparation can be eaten in Paleo diet and is way more flavorful and appealing than a microwaved bowl of plain cauliflower grains. Just make sure you do not end up over cooking the cauliflower grains else you will get a lumpy mass to serve instead of fine flavorful grains! Finely grate the cauliflower into fine grains (1). Heat the oil in a pan (2). Add red onions to the hot oil and cook it for 2 minutes or until light pink in color (3). Season the onions with salt and black pepper powder. Stir in the grated cauliflower into the sautéed onions (4). Mix the cauliflower carefully with light hands and take care not to crush the cauliflower grains into a mash (5). Cook the cauliflower for about 3 to 4 minutes. Drizzle the lemon juice evenly over the cauliflower rice and mix it well (6). Transfer the cauliflower rice into the serving dish and garnish it with the parsley slices. Serve immediately and enjoy! Grate the cauliflower in to fine grains. You may grate the cauliflower grains ahead of preparation and store it in the refrigerator as well. Just take out the cauliflower about half an hour ahead of the time you plan to cook and serve this Paleo preparation. You may alternatively use white onions to the preparation to get a more plain-ish taste. You may season the preparation with additional herbs and spices based on the main dish that you are serving the rice along. Try not to stir the rice with ladle too much and rather shake the cooking pan itself to mix in the ingredients.